There are a lot of benefits to salting away money in an employer's retirement plan, whether it is a 401(k) or a pension or profit-sharing plan. Your contributions can grow and compound without being eroded by taxes until you're ready to use the money. But suppose you're in your 50s and contemplating early retirement or you need funds for another reason. Is there a way to gain access to the money in your plan without paying a steep tax price? Normally, if you're under age 59½, you have to pay full income taxes on plan withdrawals, plus a 10% penalty tax. However, several exceptions in the tax law may give you a little leeway. 1. 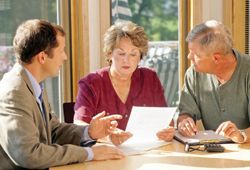 Distributions made to an estate or beneficiary. If you're the plan participant, you won't be around to enjoy this exemption, but it could help your heirs. It doesn't matter if you die before that age 59½ cutoff. The usual 10% tax penalty doesn't apply to any retirement plan payout made after a participant's death. 2. Distributions made because of disability. This applies if you suffer a disabling illness or injury, but only if the disability is total and permanent. 3. Distributions made to cover post-secondary education expenses. These costs include education for you, your spouse, your children, or even your grandchildren. Eligible education expenses include tuition, fees, books, and supplies. 4. Distributions made to cover deductible medical expenses. This exception applies only to unreimbursed medical expenses that exceed the annual tax-deduction threshold--now 10% of adjusted gross income. 5. Distributions made to the IRS. If the IRS imposes a levy, distributions from your plan made as a result before age 59½ aren't subject to the 10% penalty. 6. Qualified reservist distributions. Generally, this applies to a reservist in the U.S. armed forces who is called to active duty for at least 180 days. 7. Substantially equal periodic payments (SEPPs). If you take a series of SEPPs over your life expectancy, or over the life expectancy of you and a beneficiary or beneficiaries, there's no penalty for withdrawing money before the usual cutoff. Once you begin distributions, they must continue for at least five years or until you reach age 59½, whichever is longer. The IRS offers several options for calculating the amount of each payment. 8. Distributions upon "separation from service." When you leave your company--because you're retiring or switching jobs or because you've been fired--you're entitled to take penalty-free distributions from your plan. But you have to be at least age 55 to qualify--or 50 in the case of some government benefit plans. 9. Distributions made because of a divorce or separation. In this case, to avoid the 10% penalty, the money has to go directly to an alternate beneficiary or payee under a qualified domestic relations order (QDRO). 10. Distributions of dividends from a qualified employee stock ownership plan (ESOP). An ESOP, a type of stock bonus plan that has some features of a traditional pension plan, typically is funded with an employer's stock. The ESOP may allow cash payouts to participants that won't be subject to the normal 10% penalty. What about distributions from a traditional or Roth IRA? The rules are similar, but with some exceptions. For instance, because these aren't employer-sponsored plans, early retirees who are age 55 can't use the exception when they separate from service. Also, payments made under a QDRO or dividend payouts through an ESOP don't apply. But there are a few other penalty-free exceptions for IRA holders. For instance, you can use money from your traditional IRA to pay medical insurance premiums for yourself, your spouse, or a dependent while you're unemployed and you can spend IRA funds to meet qualifying first-time homebuyer expenses. Remember—while these exceptions might help you avoid the 10% penalty tax for early withdrawals, if you take money from a 401(k) or a traditional IRA at any age you'll still owe federal income tax on that distribution. The money you withdraw generally will be taxed at ordinary income rates reaching as high as 39.6%. Be careful to manage your account so you can minimize the overall tax impact with an eye on reducing or eliminating the 10% penalty.